A report in the Sunday Times newspaper says Amazon is currently looking to acquire a “significant number” of retail locations in the UK. These would most likely be used to bring its cashierless Amazon Go supermarkets to the British high street. According to the Sunday Times, Amazon is currently in the market for retail sites sized between 4,000 sq ft and 5,000. To give you a sense of scale, that’s roughly halfway between a Tesco Express convenience store, which can be as small as 2,000 sq ft, and a larger Tesco Metro supermarket, which can measure as much as 10,000 sq ft. In all likelihood, however, Amazon’s effort will likely hold more product than the equivalently-sized traditional supermarket, because Amazon Go doesn’t require the installation of bulky checkout registers or self-checkout machines. Amazon launched the first of its four cashierless supermarkets in Seattle earlier this year, after unveiling its vision back in 2016. The stores replace traditional registers with a complex computer vision system which monitors what a user places in their basket and automatically charges their credit card upon exit. There’s no news on when Amazon Go will hit the UK, but some analysts predict it could be as soon as the end of this year. But will it take off? That’s a tricky question. The UK’s supermarket landscape is crowded. Incumbents like ASDA, Tesco, and Morrisons command the lion’s share of the market, with budget rivals like Aldi and Lidl offering stiff competition. It’s not clear if there’s room for another player. 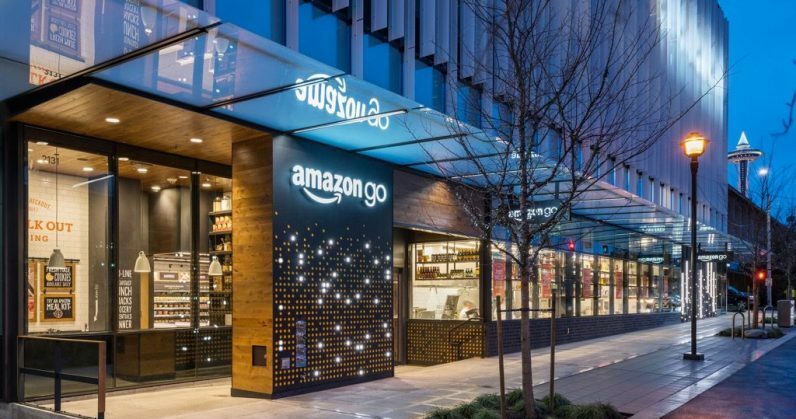 That said, Amazon Go will compete on convenience in a way that the existing competition can’t, thanks to the firm’s technology, which is already being road-tested in the States with paying customers. Amazon Go will be music to the ears of anyone fed up of hearing “unexpected item in bagging area.” It will appeal to anyone who has ever spent their entire lunch break queueing to pay for their meal deal.